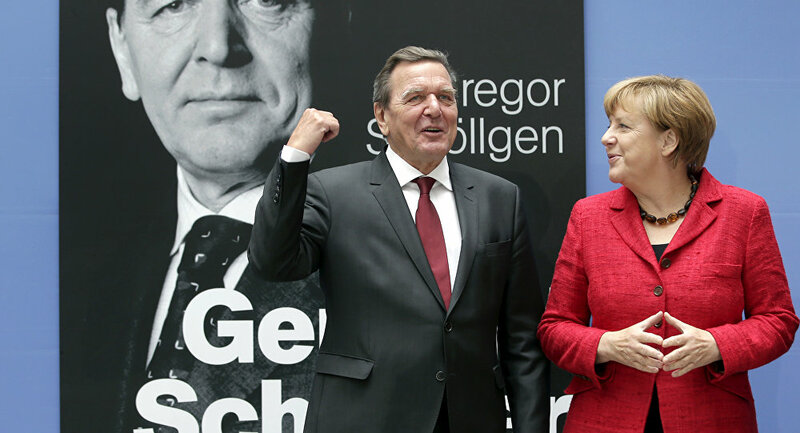 Spokesman for German government Steffen Seibert has dispelled any notion that former German Chancellor Gerhard Schroeder will be slapped with punitive sanctions for holding top-level posts at state-run Russian companies after he left the German government. According to the rep, Angela Merkel saw "no reason" to punish and long-time leader of the Social Democratic Party of Germany for his current work, as the Ukrainian Foreign Minister demanded earlier this week. Ukraine's Foreign Affairs Minister Pavlo Klimkin came for the meeting with his European counterparts during the "Ukraine + Group of Friends of Ukraine in the EU" conference in Brussels, which he used as a chance to blast the elder statesman. He insisted the EU must impose sanctions against Schroeder, naming him in an interview with German tabloid Bild "the most important Putin lobbyist in the world." According to him, it’s a logical extension of sanctions against some Russian companies and officials. This escapade came immediately after the presidential elections in Russia, which Vladimir Putin won by a 60 percent margin. The Ukrainian party was infuriated that the vote took place in Crimea, which the country maintains has been occupied illegally since 2014, when Crimeans voted overwhelmingly to join Russia in a referendum. During the recent elections, Putin got more than 90 percent of the Crimean vote amid 70% voter turnout. Klimkin's “lust for blood” was backed by some public figures both in Germany and other countries. NATO's former Secretary-General Anders Fogh Rasmussen, who is an adviser to Ukrainian President now, told the press “the best way to proceed will be to really block the Nord Stream 2 project." Gerhard Schroeder, who was the leader of the German Government for 8 years from 1998 till 2005, became the head of the shareholders' committee of Nord Stream AG, after he stepped down. The Russian fuel giant Gazprom holds a 51% share. It aims to build a pipeline under the Baltic Sea and bypass the continental route which stretches trough the Ukrainian territory. Later Schroeder became chairman of the board at Nord Stream 2, an expansion of the initial venture. In 2017 his decision to accept an offer to become an independent director on the board in the Russian oil producer Rosneft, which was affected by sanctions for Russia’s foreign policy towards Ukraine, was criticized in Germany. Angela Merkel, who said "I do not think what Mr. Schroeder is doing is okay."